First, let’s start with a disclaimer. Early morning workouts aren’t for everyone. Your work schedule, your family situation, or even your unique personality and body chemistry might mean that morning workouts aren’t the right for for you—at least for this season of your life. That being said, studies show that early workouts can lead to more restful sleep, increased productivity, and higher energy levels. Plus, there’s something pretty awesome about checking your workout off your to-do list first thing in the morning, am I right?? When you hit the gym at the crack of dawn, you get an instant confidence boost and a burst of energy to power you through the day. You start off your morning feeling productive, and you don’t have to worry about your workout for the rest of the day—you just get to reap the benefits! 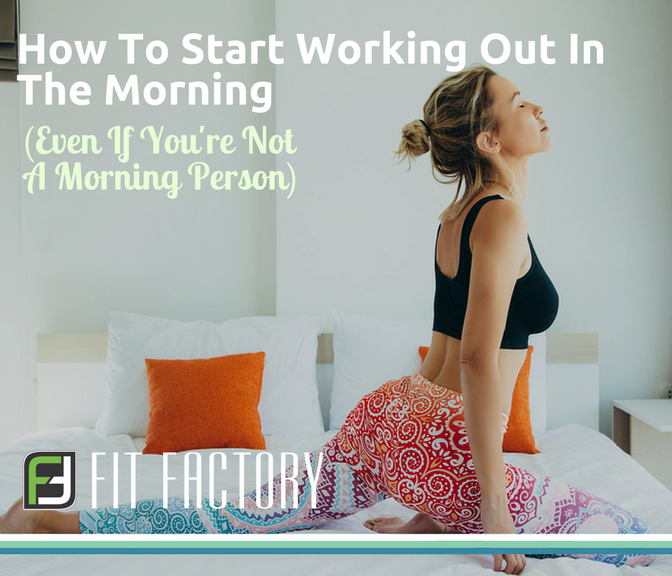 So, if you want to start working out in the morning...but the whole get-out-of-bed thing has got you worried, here are a few tips for becoming a morning workout person. Set yourself up for success by getting a full night of sleep. You can’t expect to bounce out of bed at 5:30am if you didn’t crash into bed until the wee hours of the morning. In fact, if you haven’t gotten at least six hours of sleep, it may be healthier to allow your body to rest more than to force yourself to complete an intense workout. Prepare for your next morning workout by getting to bed at a reasonable time—your future self will thank you. While you’re switching to a morning workout routine, be realistic about the transition period. If you’re used to staying out late with friends (or with your latest Netflix obsession) and sleeping in until 9:00am, you won’t instantly become an earlybird. So, start slowly—start waking up fifteen minutes earlier every day, and, before you know it, your internal body clock will reset and you’ll easily (or, at least, more easily) be able to hit the gym by sunrise with no problem. When you’re changing up your workout schedule, preparation is your new best friend. Set aside a few minutes each evening to pack your gym bag, lay out workout clothes, and make a simple breakfast. This prep work will make it easier for you to get out the door the next morning (especially if you’re still half-asleep). Also, being prepared will make you less likely to make excuses, hit the snooze button, and snore through your scheduled workout. Still not sure if working out in the morning is worth it? Start tracking your progress. After each workout, write down how you feel—mood, energy, stress levels. Also, at the end of each week, record your number of clocked-in workouts, and any weight, muscle, or measurement goals you’re tracking. This simple record-keeping will help you realize if a morning workout routine is the right option for you. After a few weeks, you’ll start to see patterns develop. Are you working out more regularly? Feeling more energetic, balanced, and productive throughout your day? Hitting your goal milestones? Then you’re doing something right. Keep listening to your body and paying attention, and you’ll find the perfect exercise rhythm for your schedule and your goals. So, it’s time to set your alarm clocks, pack your gym bag, and schedule your workout. We can’t wait to see you tomorrow at Fit Factory...bright and early! 4 Reasons You Should Never Skip A Monday Workout: healthy tips for consistent exercise that leads to increased productivity and energy, faster achievement of health and fitness goals, and increased energy and happiness levels. How to motivate yourself to workout when you feel too busy to workout, guilty for taking the time to workout, and too tired to workout.